Calvin is a young starling who is different from his three brothers, four sisters and sixty-seven thousand four hundred and thirty-two cousins (as this humorous book points out, starlings have big families). When it comes time for the young starlings to discover the world around them, Calvin’s family members stick strictly to the bird-appropriate stuff but Calvin discovers the addictive joy of reading. All summer, while Calvin’s cousins and siblings are learning about important avian skills such as flying, swooping and flock formation, the only thing about Calvin that takes flight is his mind — in the the library. He eagerly reads about all types of subjects, earning him nicknames like “nerdy birdie,” “geeky beaky” and “bookworm” from the others, but he remains undaunted. 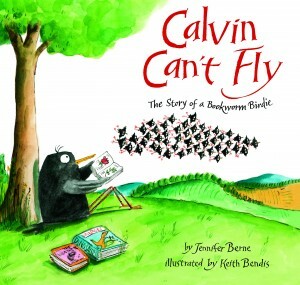 When autumn arrives, the starlings prepare to migrate, leaving Calvin with a problem: he still cannot fly! Eventually, his flock crafts a solution straight out of James and the Giant Peach and they begin to tow Calvin south. He is delighted to see the geography that he has only read about in books but soon he identifies a major problem that none of the other birds have any reason to know about: they are flying straight into a hurricane! Calvin is able to direct the flock to safety because he has read about hurricanes, and after the danger passes, the starlings have a celebration in his honor. During the party, Calvin is so thrilled that he dances, hops and flaps around. By now, readers of this darling story will not be surprised to learn that these flailing motions lead to flight, and Calvin proudly flies off with his flock as they continue their journey south. 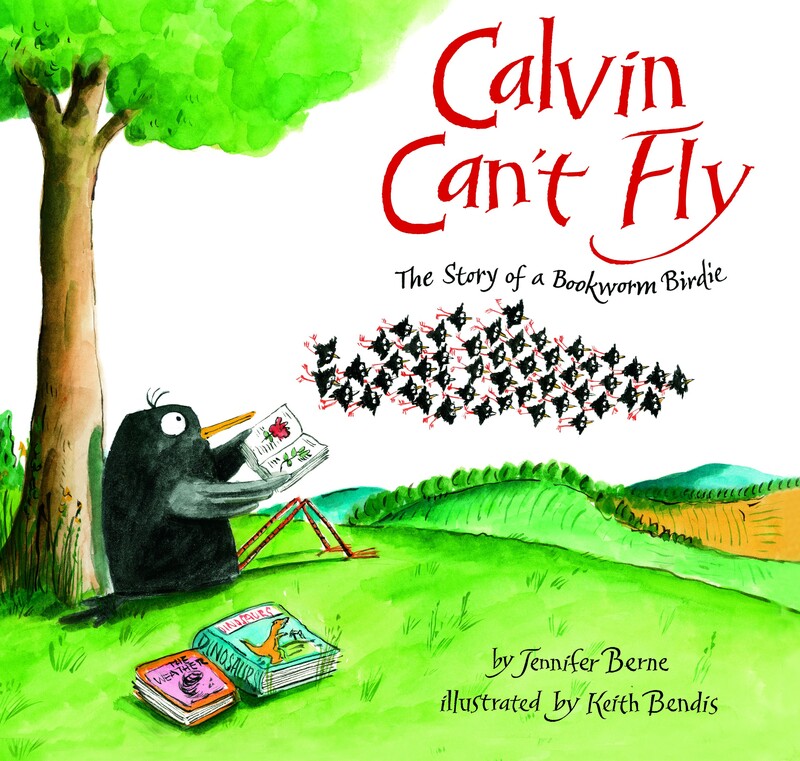 Calvin Can’t Fly: The Story of a Bookworm Birdie is an appealing and adorable tale of what it is like to both follow your bliss and live within a community. Author Jennifer Berne does an admirable job of creating a dear, headstrong little birdie who loves learning but at the same time shows us how important it is to be surrounding by a caring flock. Illustrator Keith Bendis’s pictures will delight both small and large readers with his charming depictions of Calvin and his adventures. This is a highly recommended read for ages 4 and up.